Kelly Loneman from Image Market found my website through an internet search, as most customers do. He had a large trade show in Seattle in early May of the same year. With our general project timeline of approximately 16 weeks, Kelly & I had to work smart and quickly to ensure the delivery of the custom toys was on time for their big event. We walked him through the steps, getting approvals on rough sketches, clean sketches, a rough prototype and then a finished prototype. 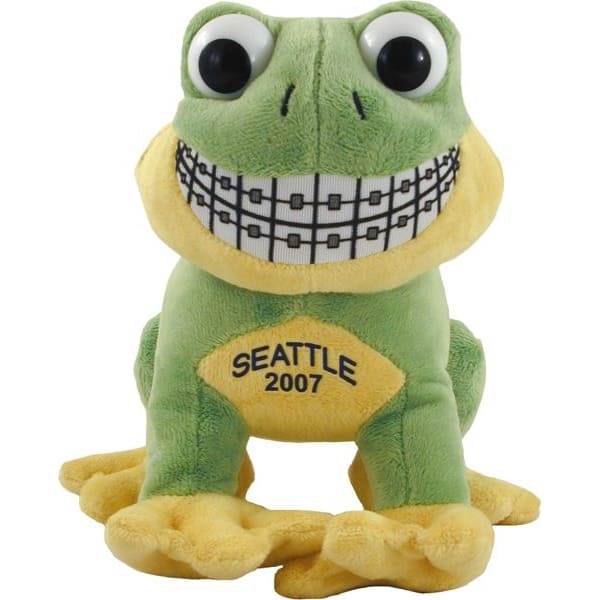 One of the unique features of the Smiling Frog is the braces on his teeth. 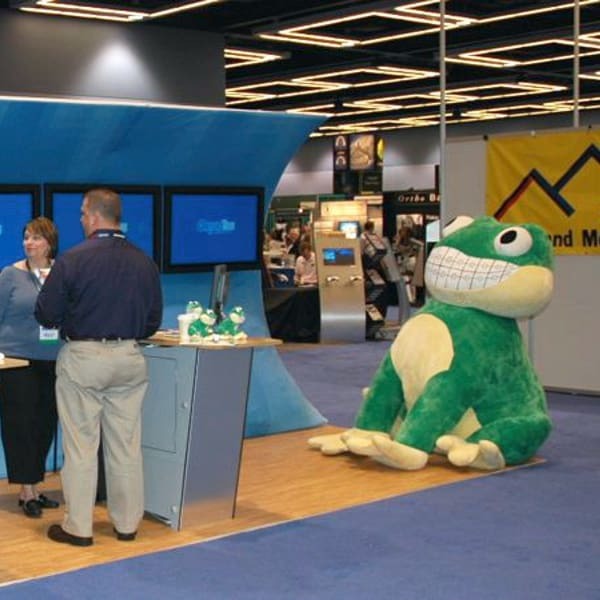 He wanted 6,000 small frogs to give out at their trade show but wanted an idea on how to really draw attention. I thought it would be great to have one huge Smiling Frog that they could just sit on their floor. I’ve made big toys in the past, but I really wanted to make something that made the customer say ‘Wow’. Of course that would mean that trade show visitors would also say the same thing. The result was a five foot, stuffed Frog. For shipping it, I did not have a standard cardboard box to ship the large Smiling Frog with, so I had to look at other options. I explored having a custom cardboard box made. The price seemed very reasonable, but I quickly realized that a cardboard box would not be strong enough to support the 400 pounds of material and stuffing. Another thought was to make a custom wooden crate to house the frog. Again, there was an issue of time sensitivity, plus the crate would add greatly to the overall weight of the shipment and I wanted to keep it light to help keep my customers’ shipping cost down. A typical pallet is 4′ by 4′ but we were able to find some larger pre-made pallets that were 5′ by 5′. I decided to place the frog on the large pallet and wrap it in plastic, before encasing it with a custom cardboard box. 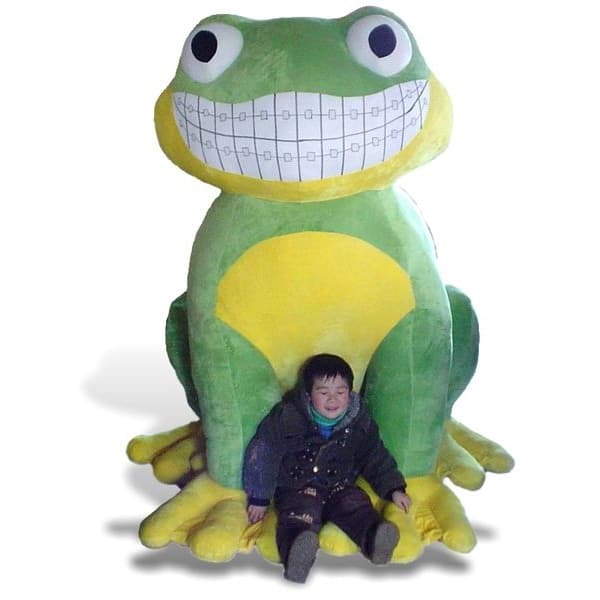 With the correct shipping information printed on the box, we finally had the best possible method of getting the large Smiling Frog from China to Seattle. The Smiling Frog order shipped out and was cleared through customs without any hesitation and the final leg of delivery was arranged with a local trucking company. All the toys arrived to the trade show several days before the event started. 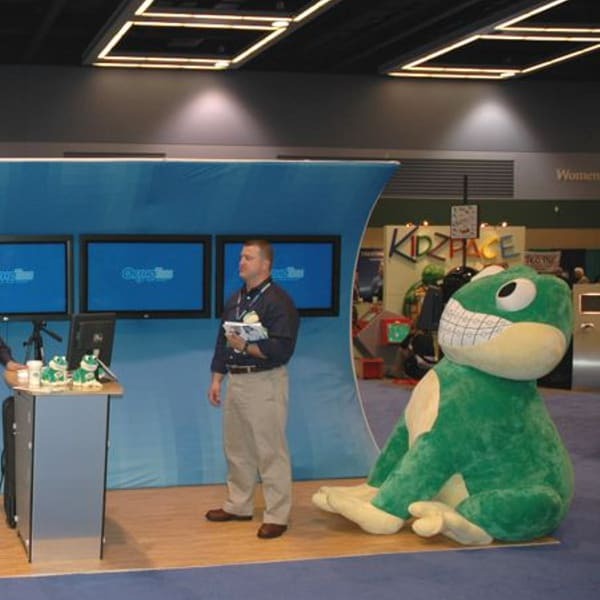 This allowed Kelly and his team enough time to set up their booth with their large Smiling Frog well before the start of the show. The frogs were a huge success. A customer would come up and give it a big hug. right by our booth. The publishers of the main industry magazine stopped by and took photographs of our booth in order to do a story of our company for a July issue. This will be great advertising. The small frogs were such a hit. You would have thought we were handing out hundred dollar bills. Again. I can’t thank you enough making our show such a success.